Model: Marked 1936, however the stock appears to be a later model 36 ADL. This rifle was likely part of a limited production post war with parts on hand. Year of Manufacture: 1941 – 1945 (http://marlin-collectors.com/forum/viewtopic.php?t=6347&start=30) A few case colored models were put together in 1945, after the war, from parts on hand. The features to the stock are not consistent with a 1936 variation 2 and have some of the later model 36 features. Sights / Optics: The front sight is a hooded bead on a raised ramp dovetailed top the barrel. The rear sight is a marlin leaf and elevator sight dovetailed to the barrel. The rear tang is factory drilled and tapped for a tang sight (not included). The receiver IS NOT drilled and tapped for a receiver sight. This is how we narrowed the date of manufacture to prior to 1945, after that date the receivers were drilled and tapped. Stock Configuration & Condition: The stocks are deluxe checkered with a hard rubber buttplate and pistol grip cap. The Marlin “bullseye” is on the belly. The stock comes equipped with front and rear marlin detachable sling swivels (this stock was featured on Model 39A ADL rifles post 1940). There are light patches of finish loss, some light scratches and compression marks. There are a few deep marks in the belly from the sling swivel making contact. There is a notable old scratch on the underside of the forend. It has darkened with age and oil from the years. The LOP measures 13.5” from the front of the trigger to the back of the Hard Rubber buttplate. The stock rates in about Fine – Excellent overall condition. Bore Condition: The bore is Bright and the rifling is sharp. There is no erosion. Overall Condition: This rifle retains about 95%+ of its metal finish. The balance of the finish shows light wear from handling and storage. There is some light surface frosting starting on the case colors of the receiver. The case colors are still very vibrant and beautiful. The muzzle has a small mark of finish loss. The screw heads are slightly disfigured, but still serviceable. The markings are mostly sharp, there is some lightness to the edge of the markings on the barrel. Overall, this rifle rates in about Fine – Excellent condition. Mechanics: The action functions correctly. We have not fired this rifle. As with all previously owned firearms, a thorough cleaning may be necessary to meet your maintenance standards. Our Assessment: WOW! This rifle has light marks from handling and storage, with a strong bright bore and a beautiful stock. 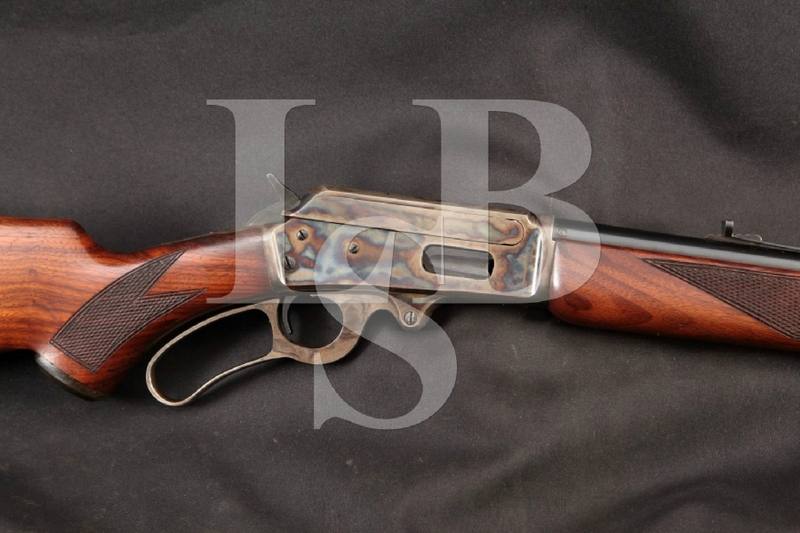 We are conservative in our estimates, and this gun would be excellent in a lot of collections. The only thing that held us back was the scratch in the forend and the light frosting to the receiver. Otherwise the Colors on the receiver are so bright the gun looks to good to be true. This gun stumped us for a while, this “B” prefix gun appears original, but has a stock that is not consistent with the 2nd variation 1936 rifles. There was no mention of this in Brophy’s book “Marlin Firearms”, so we scoured the web and found numerous accounts of 1936 marked tang rifles being manufactured just post war with the parts that were still in inventory. This would explain the use of a lot of early metal parts in high condition and a great ADL stock. This marlin will turn heads and a nice conversation given the post war configuration.